BRYAN EATON/Staff photo. 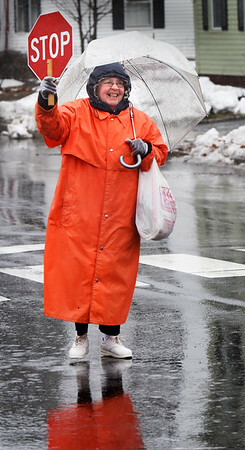 Newburyport Schools crossing guard Peggy Lysik smiles at students as they cross Greenleaf Street at Pond Street while wearing a heavy duty raincoat and holding an umbrella. Rain is forecast to continue Tuesday with clearing on Wednesday.